Will it end with a whimper or a bang? Is The Big Bang Theory TV show cancelled or renewed for a 13th season on CBS? The television vulture is watching all the latest TV cancellation and renewal news, so this page is the place to track the status of The Big Bang Theory, season 13. Bookmark it, or subscribe for the latest updates. Remember, the television vulture is watching your shows. Are you? The 12th season of The Big Bang Theory is averaging a 2.26 rating in the 18-49 demographic and 12.89 million viewers. Compared to season 11, that’s down by 17% and 8%, respectively. 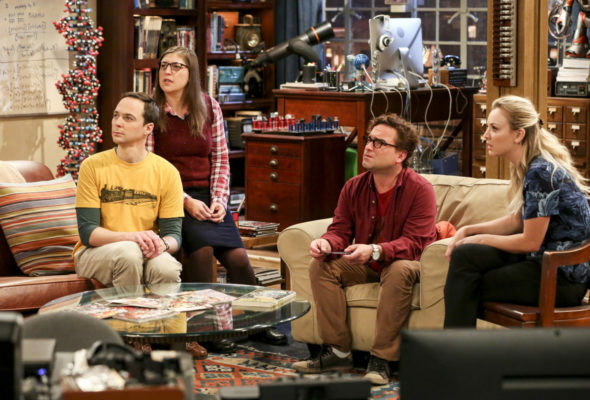 Find out how The Big Bang Theory stacks up against the other CBS TV shows. On August 22, 2018, CBS announced The Big Bang Theory would end with season 12. The last episode airs May 16, 2019. Could it return for a 13th season one day? Stay tuned for further updates. Don’t spend the season wondering whether CBS will cancel or renew The Big Bang Theory for season 13. They previously announced this would be the comedy’s 12th and final season. Still I’ll keep an eye on the Nielsens and update this page with breaking developments. Subscribe for free news and The Big Bang Theory cancellation or renewal alerts. TV show ratings are still important. Follow The Big Bang Theory‘s weekly ups and downs. Find more of The Big Bang Theory TV series news or other CBS TV show news. What do you think? Is The Big Bang Theory TV series ending at the right time? If it were up to you, would CBS cancel or renew The Big Bang Theory for season 13? The Big Bang Theory: Is the CBS TV Show Cancelled or Renewed for Season 12? I will miss Big Bang Theory. It’s been great fun watching these science nerds come into their own. I’d love to see Raj lose his “neediness” and show real strength in these last episodes. They’ve all grown up but they’ve left Raj behind. GREAT group of actors. Won’t be the same without them!